Home Safety What do Hard Hat Standards Mean? The main standards are for both impact protection and electrical insulation. 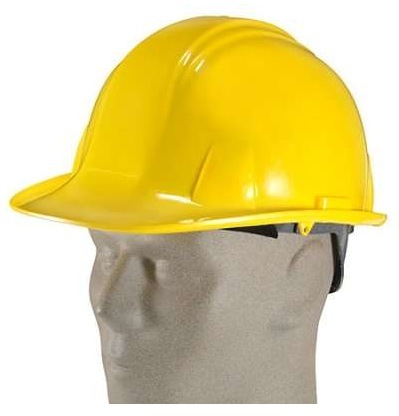 Actually, there are two main types of ANSI impact standards for Hard Hats–creatively named Type I and Type II. Regarding electrical shock resistance, there are three classes: E, G, and C.
C (Conductive) gives you no protection at all against electricity. G (General) is tested at 2,200 volts for 1 minute, with 3 milliamps maximum current leakage. E (Electrical) is tested for force transmission first, then tested at 20,000 volts for 3 minutes, with 9 milliamps maximum current leakage; then tested at 30,000 volts, with no burn-through permitted. Back to impact protection, both types will withstand an 8 pound ball dropped from a height of 5 feet onto the top of the hard hat. Maximum peak force here would be 1000 pounds. This test is done at both 0 degrees F and 120 degrees F.
Another test that must be passed by both helmets uses a helmet on a fake head form. Here, a 2.2 pound pointed steel dart (yeah, we’re starting to feel sadistic, too) is dropped from a height of eight feet onto a 3-inch circle at the apex of the h at. In order to pass this test, the steel penetrator must not make contact with the head form. The Type II tests include an 11-pound helmeted head form being dropped on two anvils, one flat and one rounded, at a maximum force of 150 “G’s.” Off-center penetration is tested with that 2.2-pound penetrator dropped from a height of 4 feet. The Type two standard also includes a test for chin strap retention. Here a 22.2-pound (we don’t know why they can’t just use a simple 22 lbs. . . .) is attached to the chin strap and dropped from a height of 4 inches. To pass, the strap can’t elongate more than 1 inch or detach from the hat. Here at Working Person’s Store we have a nice collection of Type I Hard Hats for your review.